"A beautiful female of correct size and construction. Lovely head and ear-set, excellent oval bone, excellent feet and pasterns. Although at times she was quite wild, when she did settle down and the double handler let her perform on her own, she moved beautifully on a loose lead. Excellent expression. 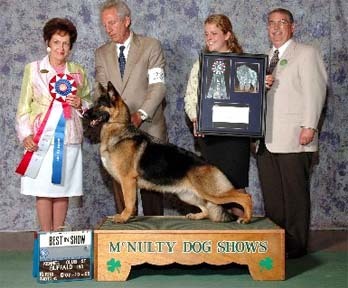 She is very correct coming and going and an excellent representation of the breed." "The magnificent top winning show-stoper, credited with putting shepherds back in the public's eye, could live in my house anytime. She wrote the book on beautiful. Not quite the performance in motion of the first three, everything else put her way up there."